PRS’ original axe was the Custom 24, so, of course, it’s only appropriate that one of the finest SE guitar models is the SE Custom 24, a lower-cost version of the original Custom 24 flagship electric guitar. It priced nearly at a quarter of a “original” PRS Custom 24, so how do they compare? Lets take a look at the guitar’s construction, first. The PRS has a beautiful maple top (flame-maple veneer) and a nice mahogany back. The guitar also comes standard with a maple neck and rosewood fingerboard. Of course, as in the name… the 25-inch scale SE guitar features 24 frets; modeled after the original Custom 24. Chrome Nickel hardware is a standard, as are the Paul Reed Smith designed tremolo bridge and tuners. The PRS SE Custom 24 comes geared up with two zebra pickups. The fingerboard is outfitted with moon inlays. My first impression of the SE Custom 24 was how wonderful it played and felt, outstandingly for a “budget” axe. The wide-thin neck was easy and smooth to move about. 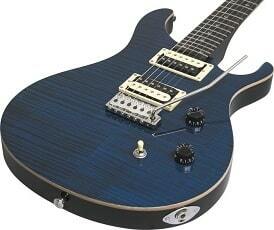 Basically, It felt like any other PRS guitar I’ve played, including those cost 3 times as much. The smoothness of the guitar’s neck made it extremely easy to sweep arpeggios and bend strings like we were playing a $2,800 guitar. The PRS-designed tremolo bridge has an extremely comfortable feel to it, and it didn’t go out of tune much… though the guitar did go out of tune with some extreme whammy action. Unlike higher priced PRS Custom 24s, the SE Custom 24 does not come equipped with locking tuners. My review guitar came in a gorgeous blue finish, and though it is not a real flamed top finish, it was nonetheless really stunning. I was blown away with the sound of the pickups and the extensive range of tones obtainable. This is an axe you can use for blues, rock, country, or jazz with no problems. The PUPs probably do not have the deepness of its big brother counterpart, the PRS Custom 24, but they are exceedingly great pickups in their own right and certainly do not necessitate running out to buy replacement PUPs. Overall, I am extremely impressed with the PRS SE Custom 24. You don’t need to think of this axe as an “economical” guitar; think of it as a wonderful electric guitar for guitarists on a tight budget. With a street price of approx $650, this guitar is definitely an axe to consider when shopping for your first, next or backup guitar. It’s a guitar that is for anyone looking for the ‘best bang for the buck‘. These ARE very good axes period! Money or no money! I have examined and played a few of the SE models. BETTER than any equivalent priced/appointed Epiphone or Squier! I work in music retail, so I get to handle a lot of different instruments. Another thing I like the PRS is how nice they set-up. Axeman, do they come from the factory set-up or do you have to set them up at the store? Umm i don’t know about the factory set up, as we don’t sell them. But I have some come thru the shop from time to time. But the set up i saw on new 1s seemed above average for a factory set up. They still had room for improvement any way!